My mother gave me a lot of cookers and dishes, when I got married. But they are 14 years old. Recently some staff was broken. I can't sieve some small food on this kitchen sieve. There are one hundred waka poem cards based on Ogura Hyakunin-isshu, a famous poetry anthology selected by Fujiwarano Teika in the Heian period.We play this old card game in New Year's Holidays with family. It is Heian period about 1,100 years ago. 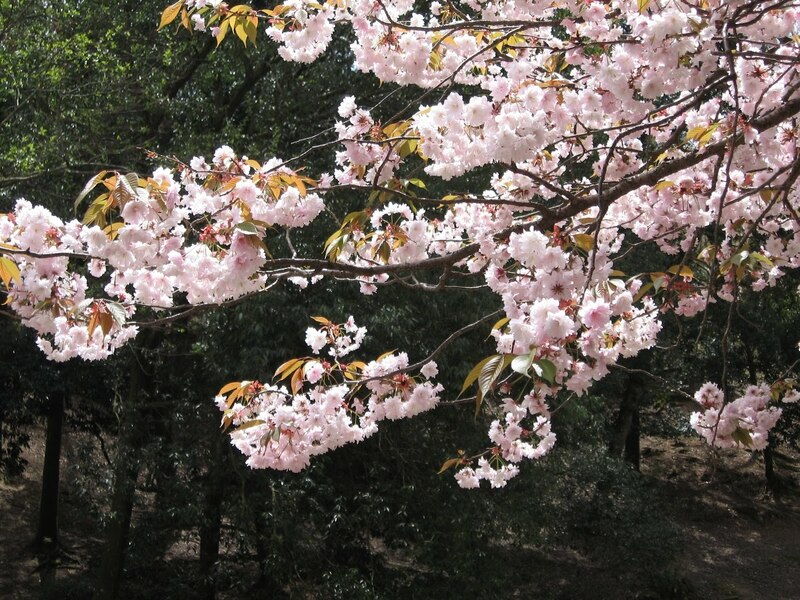 The double cherry blossoms are smelling sweet in bloom today in the imperial Court in Kyoto(Heian) as well as long ago in the ancient capital in Nara. 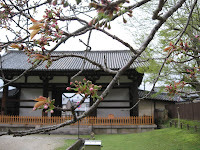 Nara was ancient capital 1300 years ago. 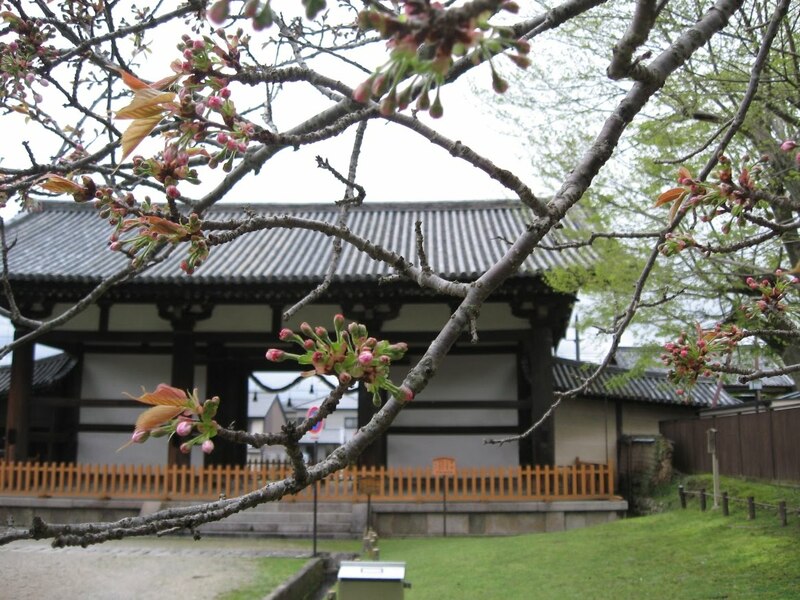 There is "Celebrating the 1300th anniversary of Nara Heijo-kyo Capital in 2010" this year. Yae-zakura in Nara My uncle lives in Nara. He sent me pictures yesterday. Last Sunday, my sons and my husband watched a movie called "I am legend". Actually I don't like to watch scary movies. Really really I don't like them. But my sons watch it on TV. I have no choice . And I recognized this story long years ago. When I was very young, I watched a movie with mother and grandmother on TV in my house. It was very scary movies. After that I couldn't go bathroom by myself. And I couldn't sleep. My grandmother asked me "Are you scared?" I and my mother said "NO". Maybe that movie might be "The Omega Man". My younger son is really into Michael Jackson's song. My younger son is singing some songs in English. But he can't speak English. He just sings in his on way. It is hard to catch Michael's song for us. Michel sings "Annie are you OK"
He might hear "any other woo-kiing" ??? I try to sing this song too. But I can't sing it. It is difficult to catch English lyrics..
You can hear "Annie are you OK"?? Please imagine you are the principal of your your junior high school. What two changes will you make? For each change give one or two reasons. Write less than 50 words in English. This is a entrance examination of a high school. First, I didn't know "principal". Ant I was confused of writing 50 words. I couldn't write a answerer. I was very depressed of it. I am learning English long years. My older son is the second year of junior high school now. Next year he has to have entrance examines. If he can do this examine easily, I will be proud of him. I made lunch boxes for us. My older son takes a lunch box to Junior high school. And sometimes my younger son takes to elementary school. Also sometimes I takes a lunch to work. Actually it's a pain in the neck to make a lunch Monday morning. This Saturday, it is parents day in his my older son's school. I visited his English class with my younger son. But my younger son doesn't like to see English school. So we stayed very short time. By the way, I think you feel strange about parents day. In japan schools begin April. And usually schools open for parents. My older son is 13 years old. He goes to junior high school in our town. Maybe your schools don't have parents day. We found tadpole in his school of biotope space.. 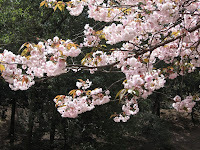 In Japan, the cherry blossoms are in full bloom.